Hey, i'd like to know about you too ! 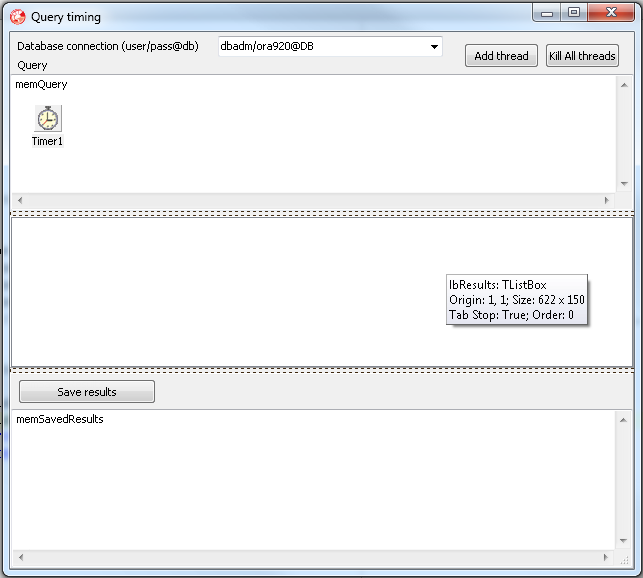 I have seen many questions in this Delphi topic area where queries in threads are needed or suggested. I know bumped into a similar need. This article will address some of the concepts when dealing with a multithreaded delphi database application. Our only remaining oracle 9 production database on a 7 years old server repeatedly lost disk access. The oracle db has been due for replacement for a few years, but vendor issues have prevented this. A other server was setup and I moved the db. Off course the hardware wasn't exactly the same and soon people complained about performance. This was odd, taken into account the more recent hardware. I won't go into detail about the oracle performance tuning. After some searching we found some differences but most eye-catching was disk sorting. A unsorted query took 500ms, but sorted it took 8 seconds. Playing around with sort_area_size fixed this, but after some time other connection problems occurred. I decided to play around with some database parameters to find out what the best settings would be. I needed something to see impact on query execution time when changing parameters. I'm not a guru at oracle performance tuning, so i setup a test system to play around with. I wanted a app which would repeatedly time the execution of a query, catching and ignoring any errors and be able to connect to any of my oracle databases. I also wanted to optionally save test results. The goal for this app is to highlight the threading approach to this problem. So the design for the main form must be kept simple to reduce overhead. I used a listbox for the timing results, a memo for query and saved results and edit for the db connection. Some panels, splitters and labels were added for the look. The "add thread" button should start a thread with a given query on a given db. I need a structure to save the timing of the queries. I don't know how many threads will be running simultaneously and it will never be a fixed number. The structure needs to be dynamic. Expanding together with the number of threads being created. A descendant of TCollection fits these requirements. The timing will be done inside a thread and saved to this collection. For protecting access to the array i will use a TCriticalSection. In multithreaded applications it is vital to protect shared resources against simultaneous changes. I put the shared resources into a separate unit uResources. This not a must but allows very tight control to the resources. The structure for holding the timing of the query is a TCollectionItem descendant. This can be added to the TCollection descendant. This allows dynamically adding or deleting items. If i would want to monitor different queries, i would have to indicate which query the result is for too. Here I'm not going to do that as I'm only interested in the same query on different databases. Placing the array variable in the implementation part of a unit makes it inaccessible to other units. A function will provide access to the array variable. The mCSTimes TCriticalSection only allows 1 thread to enter at a time. When 1 thread has access to the critical section, other threads have to wait until the first thread has left the critical section. When you add a thread to a system, you will inevitably come to the point where you want to kill or remove a thread too. This requires a reference to those added threads. I will keep a thread list so i can kill them all. I'm not interested in just killing 1 thread for this test application. To identify a thread I'll use a incremented variable nThreads. The thread class is also in a separate unit uThreads. AddThread will be passed the connection string and the query string. The thread class will TQueryThread. The basics of what the thread must do are to create connection to the database and run a query, store timing info and keep repeating that until termination. Only if there is a connection and the query is created will it be executed. Reporting should be done every pass to signal any errors. Inside a thread a new database connection must be made. If this isn't done, Delphi will find a connection in the main thread (form or datamodule) and use that. This will give a unresponsive application providing the query and connection component can work across threads. The creation should be a thread local component or a component which will only by used by that thread. Once connected to the database, don't assume you will always be connected. Any error is recorded in fMsg too. I'm interested in the time it takes the query to open and retrieve all records. ODAC components are default set to only return the first 25 rows. FetchAll := True overrules this. Some components (like the deprecated BDE TQuery) will count every record manually with a loop. The ODAC components don't do this, it's simply a variable holding a value. All the data for 1 pass is stored in thread local variables. This permits us to wait indefinitely for a lock on the shared resource without affecting the results. The thread will wait until data is copied before running a next pass. Here is the complete unit. In the create constructor there is some small calculation to distribute the threads across the available cpu. Higher up I already showed the form layout. The only things left to do are to display the information from the shared resource on screen. A simple timer is used to show the results on screen periodically (every second). I hope this helps in understanding how threads can be used in Delphi programs. Keep in mind this is a very basic threading example. For more advanced threading i can only recommend the Delphi Geek's approach and his library: Omni Thread Library.